Smart displays take a lot of the aggravation and unexpected costs out of running digital signage networks, removing points of failure and making it possible for anyone to help resolve issues at installation sites. We’ve all been there — trying fruitlessly to explain to someone at the other end of the phone or email how to do something. You try to describe what to do, but the people listening can’t see what to push or click, or they don’t understand what you’re asking them to do. It’s a very common problem for digital signage networks. Operators put dozens, hundreds or thousands of PCs plugged into displays at locations around a city, region or country, and cross their fingers that none of them ever develop problems. Because if they do — and those problems can’t be resolved using management or remote software — somebody has to climb a ladder or crawl under a desk to start checking connections and maybe tap away at a keyboard. Network operators really hope that job can be done by someone at the remote location, like the office manager or a store associate, because dispatching a technician to the site will mean the problem won’t be resolved for hours or even days. And it will typically cost the operator several hundred dollars for that service call. Getting a technician to drive out and come in — even if all they do is push a power button or tighten a connection — isn’t much different from having a plumber come out to tighten a leaky tap. They both charge by the hour. Think in terms of the impact of a network of 1,000 PC media players across a signage network. Let’s say a quarter of the sites, some time over the space of three years, develop issues that can’t get resolved without a service call. Multiply 250 sites by $225 an hour for that technician, and that’s more than $56,000 in extra, possibly un-budgeted, operating costs. So why not just get the local person on-site to do that work? First, it’s not their job. Period. Second, asking people to stop what they’re doing, and climb ladders or burrow under desks, won’t typically go well. With a PC-based digital signage network, fixing the problem may require whoever got stuck with the on-site repair job to find a spare keyboard and mouse to plug into the PC, and then get talked through clicks or commands by a support desk person on the other end of the line. So how do smart displays — all-in-one digital signage displays with built-in media players — make life better? 1. There are no connectors on smart displays that are likely to fail or come loose, unlike conventional digital signage setups with PCs and their signal cables, as well as other cables like USB. With a System-on-Chip (SoC) display, everything’s built-in. The only cable is the power cord. 2. Remote troubleshooting is simple, for anyone. Rebooting a small PC may need a keyboard or, at minimum, reaching around trying to find a power button. But rebooting smart displays — like those in Samsung’s Smart Signage Platform — only requires clicking the power button on the remote control that comes with the screens. It’s no great reach to suggest almost everyone knows how to use a TV-style remote. Some digital signage solutions providers conditioned to using PC-based systems for installations report how service calls and outages were dramatically reduced on deployments that were built around Samsung’s Smart Signage Platform. Vince Mitchell, CEO of digital signage solutions provider Pacific Digital Signs, says service desk work has already dropped by at least 40 percent for his company. “We’ve definitely seen a reduction in support hours and service requirements as we started pulling PCs off the networks, and as we continue to convert older screens to new SoC screens,” he explains. 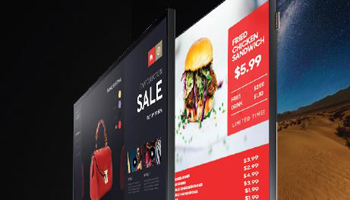 When digital signage networks are planned, much of the focus is placed on the initial capital costs for the infrastructure, including the screens. But industry experts consistently encourage operators to build their plans around the Total Cost of Ownership (TCO) for a network over a three- to five-year operating period. When that’s done properly, things like field servicing costs get factored in — and if the wrong solution is place, the network’s TCO can be much higher. Still, developing a TCO can help businesses account for any potential service costs that might arise during the digital signage life cycle, helping companies ensure smooth operation in all aspects of signage installation and maintenance. Explore the key steps involved in developing a Total Cost of Ownership model, and why it’s essential for your business.